Klong Prao Beach resorts, hotels, bungalows and guesthouses are spread out along the full length of the beach (3km+), with other accommodation on the small streets leading off the main road down towards the sand or inland towards the mountains. Being the largest area on the island, in effect the complete middle section of the west coast, you are spoilt for choice with everything from the larger Koh Chang hotels to luxurious resorts, mid range bungalows to guesthouses and backpacker hang-outs. The temple area is commonly thought of as the central section, with the nearest accommodation to that around the southern canal. From the beach, there will always be a few minutes walk to the restaurants up on the street. Wherever you stay, ambling along the sand cuts down the distances considerably, as well as being much more pleasant than the hot dusty road. Simply use the the resorts as shortcuts – smile sweetly and keep going, nobody will notice. Klong Prao Beach has the highest concentration of large upscale resorts on the island, with places like The Dewa, Emerald Cove, Santhiya Tree, Aana Resort, Centara Tropicana, Barali Beach Resort and Ramayana Resort offering standards and indeed prices a cut above the norm. With the exception of Aana Resort and Ramayana Resort which are located on the northern canal (klong) and the road leading down to it, all are found along the beachfront, giving instant sea access for those wanting a change from their excellent swimming pools. Rooms vary from those in hotel-style buildings over a couple of floors (Emerald Cove) to cabana villas on walkways (Aana Resort) to huge villas with plunge pools (Santhiya Tree) to deluxe grand villas with jacuzzis at The Dewa. 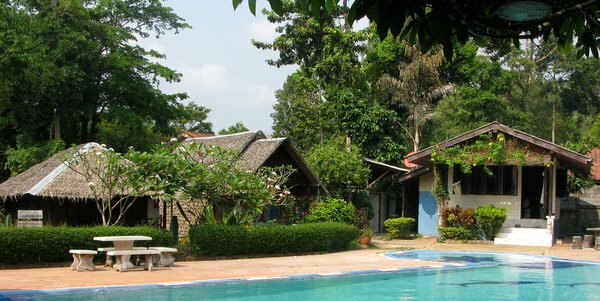 At the start of the whole area, Klong Prao Resort is another huge 2/3 star resort, popular with Thai and European tours. Prices range from 2,300bt for double up to 4,000bt for a villa room. Its sister resort, Bhu Tarn is more boutique in style, 3,000bt for a 2 room family accommodation up to 5,750bt for its suite. Noren Resort, a popular family spot, is another very solid 2/3 star choice located road side just after the central temple area. Double rooms start at 2,700bt. VJ Searenity is in prime location between The Dewa and Emerald Cove. Not in their league, it is still popular with eastern Europeans and for its location, worth considering. Prices are from 3,300bt for doubles on their website. 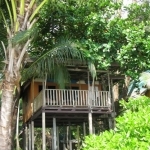 At the far southern end, three older Klong Prao Beach resorts, popular with Thai weekenders, sit side by side on the sand, Koh Chang Cabana, 1,700bt to 2,000bt a night, Magic Resort and Choc Dee Resort where fan rooms go from 700bt. Built along the northern canal where it meets the beach, Long Stay Resort has large villas with kitchens and sitting areas. A month’s rent comes in at 40,000bt, which if on a long winter holiday, maybe more reasonable than it might seem as 1st glance. On the beach at the southern end, 165 room resort with standard or deluxe rooms, suites, 50 metre pools, Italian and Thai restaurants, coffee shops and bars. Breeze Spa. A professional and self-contained package that will provide a great holiday experience. On the beach at the southern end, contemporary and stylish, deluxe rooms opening onto the long swimming pool or unique round villas and grand villas. Restaurant, beach bar, spa. One of the island’s top resorts. Large resort with superior and deluxe rooms or cabanas. Swimming pools, restaurants, bars, spa, beach volleyball, yoga. Managed by the Centara Group, so expect good service, well delivered, clean and comfortable. On the beach towards the southern end. Large resort running down to the sea. Deluxe or private plunge pool villas set in tropical gardens. 3 tiered swimming pool, spa, restaurant, bar. Contemporary villas and suites, some with private pool, set in peaceful tropical gardens. Swimming pool, children’s pool, spa, restaurant, bar. On the beach. Fabulously designed resort on the canal at the northern end, with deluxe rooms in two storey building, designer villas with plunge pools, wooden walkways, gardens, swimming pools, spa, restaurant by the klong, kayak to the beach. Inland from the canal (klong) at the northern end, another large scale resort with good value deluxe rooms and suites, swimming pool, spa and restaurants, all set in tropical gardens. Free transport to own stretch of beach some 10 minutes away. Up by the road at the northern end, selection of solid well apppointed villas around the pool or in a row on the small waterway that backs onto Klong Prao Resort, its sister. Swimming pool and restaurant. Small Swedish owned resort in the centre of Klong Prao near the road and next door to The Gallery. 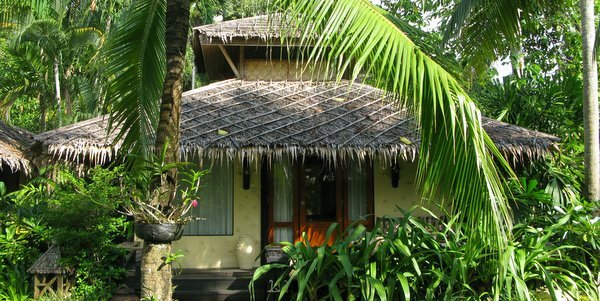 15 well- equipped bungalows, swimming pool, restaurant. 10 minute walk to the beach. On the canal at the northern end, new well appointed self catering bungalows with bedroom and separate sitting areas, looking out over the river. Restaurant and the beach a few paces away. Weekly rental only. At the far southern end of the beach, bungalows up on the hill and on the seafront, fan or a/c, standard, deluxe or family. Small hotel building. Seafood restaurant. For lower budgets, Klong Prao Beach also has a selection of smaller hotels, bungalow resorts and guesthouses. The Gallery is a practical economy hotel complete with swimming pool, a few minutes walk to the beach – superior rooms start at 2,350bt, studio rooms at 4,000bt. At the southern end opposite the entrances to Grand Cabana and Magic Resort, Kachapol Hotel is another clean and well-run motel, within very easy walking distance of the beach, with prices from 750bt for a standard double. VJ Bed and Breakfast, sister resort to VJ Searenity and indeed VJ Island View in Chai Chet, is at the rear of Klong Prao Temple. Popular with eastern Europeans, its double rooms start at 1,200bt . For the backpacker, the recently renovated Tiger Huts is probably the pick of the bunch. It also has a great restaurant, an ideal vantage point to watch the world go by. 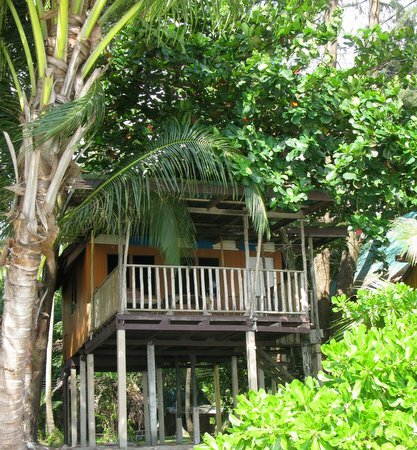 KP Huts, next door, gives you another option, with its fun brightly painted accommodation up on stilts. Prices at either start are from 700bt upwards. On the southern canal, Blue Lagoon, home of the cooking school, is a long running favourite under French management. Fan rooms can be as low as 650bt per night in high season, family rooms and the unqiue eco room at 2,000bt. Just behind it, Sabaidee Resort (T & T Bungalows) is another good value spot from 1,300bt a night. On the northern canal, Baan Talay is a stylish nautically themed guesthouse run by Phu Talay Restaurant, while Sapparot Bar and Moley’s Resort are a few doors down, each offering just a few rooms in single level buildings behind their respective restaurants and bars, prices from 1,000bt a night. 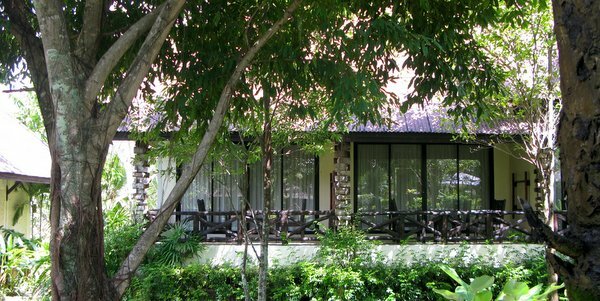 On the opposite bank, Baan Rim Nam is a long established guesthouse, popular in tripadvisor, rooms from 1,000bt to 1,900bt. Next door, Watercolours has also opened its doors in the last year (taking over the old Keereeta Lagoon), just three rooms, 1,400bt to 2,400bt. For long stay options, Leelawadee or Kongtarra, both by Klong Prao school up on the road, are happy to do deals on their nightly rates of around 1,000bt. 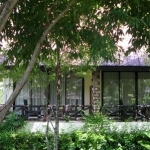 Opposite Ramayana Resort, try Baan Suan also, where large bungalows for monthly rentals are around 13,000bt to 15,000bt. P and Pu House, tightly packed bungalows set back from the road not far from the main entrance to Centara Tropicana has minimum stay of 2 nights from 3,300bt. 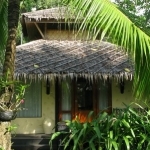 Iyara Resort, inland opposite the temple has superior rooms from 1,200bt a night, again a useful option for long stay. Big Elk Steakhouse and Bungalows offer a wide range of rooms, from just 300bt for its most basic fan to 1,800bt for a bungalow around its small pool. Newish keenly priced hotel of 48 rooms with mountain view, pool view or standard. Swimming pool, restaurant, short walk to the beach and the central temple area of restaurants and shops. A/c standard rooms in a small no frills practical hotel at the southern end. No restaurant but food available, car parking. Across the road through one of the resorts to the beach. Set on the canal at the northern end, small Dutch owned guesthouse with five a/c ensuite rooms. Kayak to the beach, jacuzzi, small restaurant. 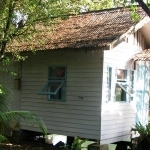 Long established, popular guesthouse with 5 double a/c rooms in adjacent houses with decks, in this converted fisherman’s dwelling on the canal at the northern end. Breakfast available. On the canal at the northern end, 3 nicely designed a/c rooms in a converted fisherman’s house with restaurant and bar area by the water. Kayak to the beach. At the northern end of the beach, newly renovated backpacker fan huts, with and without bathroom, in 3 rows on the sand. Good lively restaurant attached. Next door to Tiger Huts, brightly painted fan bungalows with bathroom, high up on stilts on the sand or more basic affairs with and without bathroom in the next row. Quiet and popular spot, restaurant on site. On the canal at the southern end, fan and a/c bungalows, including an eco build on the lagoon or in the garden at this French set-up. Family rooms, restaurant, all sorts of activities, early evening bar. Recommended cooking school at the rear. 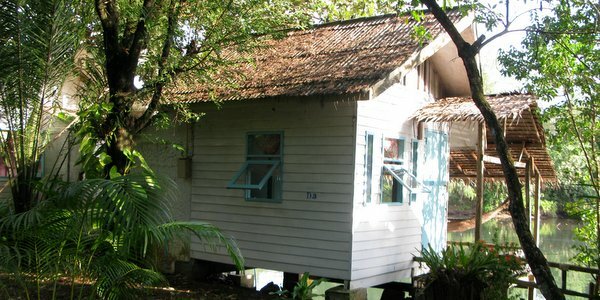 On the back road to Blue Lagoon, a handful of a/c bungalows with bathroom. No restaurant but a couple of minutes only from the beach and beach cafes over the pontoon bridge. At the southern end, inland on the oceanside of the road, about 8 minutes walk from the beach. Bungalows around a small pool, separate 2 storey motel block. Restaurant, car parking, WiFi. Friendly and knowledgeable Italian owner. Shortly after Noren Resort in the central area, wide selection of rooms in a small 2 storey building, fan, share bathroom through to queen size a/c. Bungalows also. WiFi, restaurant, small swimming pool, about 12 minutes to the beach.